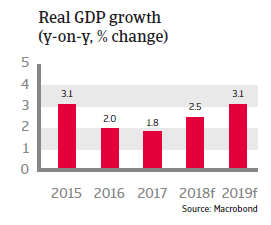 Since H2 of 2017 GDP growth has started to accelerate again, due to a more supportive external environment and the effects of monetary policy stimulus. After several years of negotiations in December 2016 a peace accord between the Colombian government and the main guerrilla group FARC was finally signed. In August 2017 the demobilised FARC rebels handed over their last weapons to UN representatives, and the government declared the 52 year-old armed-conflict formally over. The leftist-FARC turned into a political party as of September 1st. Talks with the smaller Ejército de Liberación Nacional (ELN) guerrilla group have been suspended by the government in early 2018 after several bomb attacks, but are planned to be resumed. The peace process faces major challenges, as the former FARC guerrillas could struggle to integrate into society, and some parts of the peace accord remain controversial. The March 2019 congressional elections have strengthened the hand of conservative parties that oppose certain pivotal elements of the peace accord (e.g. impunity for former FARC members). Presidential elections are due to be held in May 2018, and the outcome will have a major effect on the future of the peace process. At the same time it is expected that the orthodox economic policies of the incumbent government will be continued, regardless of the outcome. 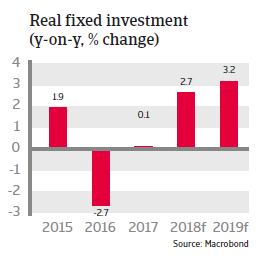 Since H2 of 2017 economic growth has started to accelerate again, due to a more supportive external environment (higher oil and commodity prices) and the effects of monetary policy stimulus. 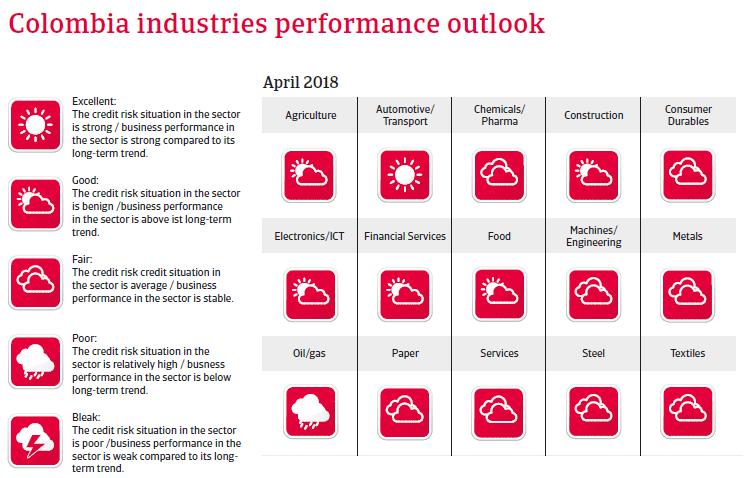 Private consumption, investment and industrial production have picked up again, and GDP growth is expected to increase by about 2.5% in 2018. 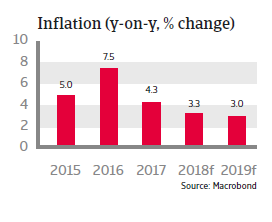 Inflation decreased in 2017 and is expected to decline further this year, which provides the Central Bank with additional room to further lower interest rates in order to support economic expansion. In recent years sound economic policies have contributed to higher earnings capacity and economic resilience. The 2016 tax reforms, with an increase of the VAT from 16% to 19% and a simplification of the tax regime, are increasingly showing their effect. Most of the government debt is financed domestically and long-term, at fixed rates. 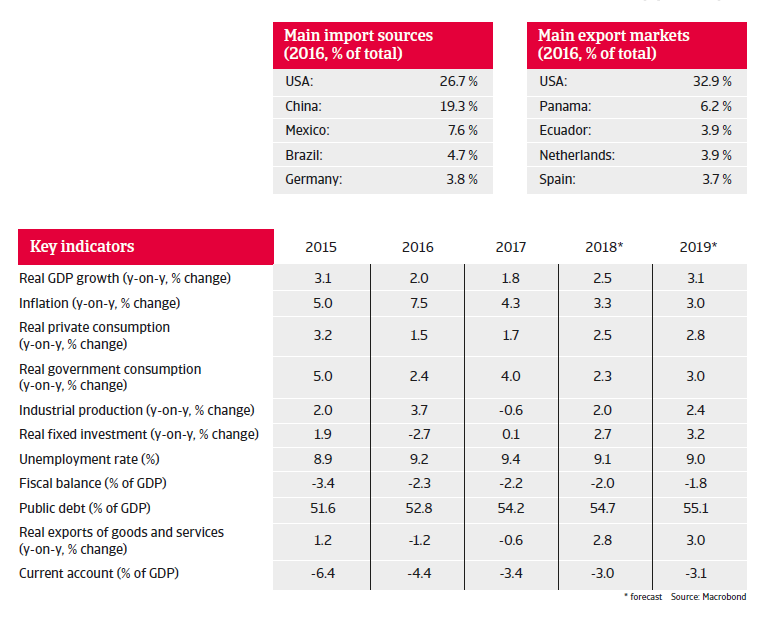 Colombia’s external economic position remains solid. The government accounts for about 60% of the country´s external debt, and while foreign debt and debt service ratios have increased since 2014 due to currency depreciation and lower export receipts, both are expected to decline again in 2018. Risks are mitigated by hedging, and stable investment grade ratings and an excellent payment record allow Colombia to easily access international capital markets. The international liquidity position is sound, with international reserves amounting to about 10 months of import cover, covering the external financing requirement. Official reserves are underpinned by a precautionary IMF Flexible Credit Line, which provides stronger insurance against heightened external risks, as Colombia remains vulnerable to adverse investor sentiment due to a relatively large stock of inward portfolio investments (at 180% of official reserves). Additionally the flexible exchange rate serves as a shock absorber, supported by limited dollarization of the economy and modest external debt. In 2018 gradual depreciation of the peso is expected, depending on the timing and the speed of US interest rate increases. The peace agreement with the FARC could lift mid-term growth rates through investments in areas that were formerly in conflict zones and improved consumer confidence. However, despite significant economic progress in recent years, Colombia still has high rates of poverty and inequality, especially in rural areas. In order to achieve sustainable long-term economic growth, job growth promotion, social reforms and infrastructure improvement would be necessary.